Can’t make it to Carolina Tiger Rescue for a tour? Do you have a Women’s Group meeting, Scout meeting, or other type of gathering that is looking for a presentation on our amazing animals? Carolina Tiger Rescue provides off-site presentations that give your group the opportunity to understand the work we do, hear a few of our rescue stories, and learn about our current animal species. The presentation can be catered to your needs and time frame. Carolina Tiger Rescue can come to your event to help “Open Your Eyes to the Wild!” We travel to events across North Carolina to introduce the public to our magnificent animals through their pictures and stories of their rescues, and to help people understand the work we do to help wild cats, both in captivity and in the wild. It is important for the public to understand the role of wild cats in their native ecosystems, as well as why they do not belong in the care of private owners, the entertainment industry, or in inhumane facilities. Please remember that we are a no-contact facility. At no time will an animal be attending an event with us. 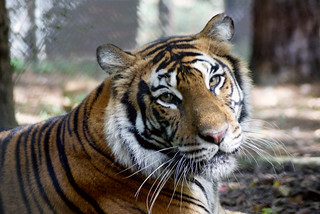 The animals spend their days in spacious enclosures at Carolina Tiger Rescue. Please contact our Education Director, Katie Cannon, for more information, or to schedule an event.